Cook pasta in a large pot of salted boiling water until al dente. Reserve 1 cup of pasta water. Drain pasta and keep warm. Toss broccoli with olive oil and pepper and spread on a baking sheet. Roast in the oven until browned and tender, about 15 minutes. Add lemon juice and zest. Keep warm. Melt butter in a pot over medium heat. Add onion and cook until translucent, about 5 minutes. Add garlic and flour and stir until mixture looks like wet sand. Cook stirring for 2-3 minutes. Slowly whisk in milk and cook until milk thickens, 5-10 minutes. Mix in parmesan cheese and cream cheese and stir until cheese is melted. Season with salt and pepper to taste. Add reserved pasta water a bit at a time if sauce is too thick. 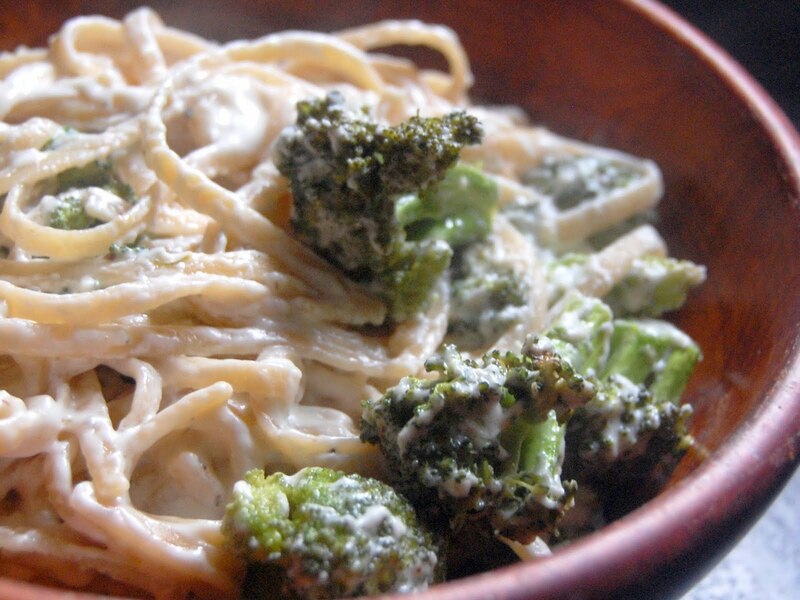 Toss sauce with pasta and broccoli. Garnish with chives or parsley.